Show your friends, family and acquaintances that you support the dairy industry by turning your profile picture red with our #NationalDairyMonth frame. 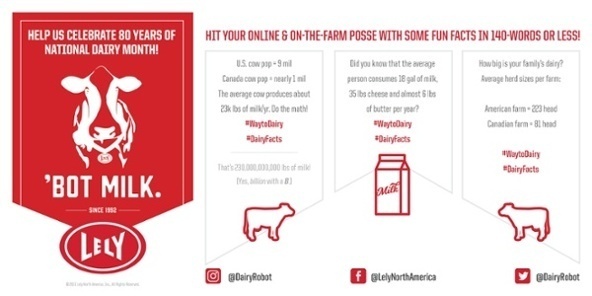 Showcase your dairy pride on social media with some of these fun facts that are each 140 characters or less! Don't forget to follow Lely as we will post additional fun facts all month long. Proudly display your love for dairy on your farm by winning an 18” x 36” ‘Bot Milk poster from Lely. To be one of 100 winners, enter now at Info.lely.com/bot-milk-poster.